If you love working with hair and makeup, perhaps cosmetology is the career for you! As a cosmetologist, you will be qualified to work with hair (cutting, coloring, and styling), as well as provide beauty services relating to the nails and skin. In this article, we will discuss everything you need to know about becoming a cosmetologist in the state of Louisiana. What Does a Cosmetologist Do? Cosmetologists carry out a wide range of duties. These professionals must carry out hair coloring services; wash and condition hair; alter hair texture with chemical treatments; properly clean and disinfect work areas and tools; recommend treatments to clients after inspecting and evaluating the scalp, hair, and skin; discuss options for hairstyles; cut hair; dry and style hair; take client payments; provide makeup analyses; provide facial treatments; administer scalp treatments; and recommend products to clients. Cosmetologists are also typically required to carry out various administrative tasks during the course of the day. Most cosmetologists work in salons. Other work environments include places such as resorts, hotels, and spas. Many cosmetologists are self-employed. It is quite common for cosmetologists to rent a chair or space in a salon. While many cosmetologists work on a full-time basis, it is also quite common to work part-time. Cosmetologists are often required to work on weekends (especially Saturdays), and during evening hours, as well. What Qualities Do I Need to Be Successful in this Field? •	Strong time management skills: Cosmetologists need strong time management skills in order to manage numerous appointments each day. •	Excellent customer service skills: Cosmetologists must consistently provide outstanding customer service, in order to keep customers happy and wanting to return to the establishment for further services. •	Physical stamina: Cosmetologists often have to spend a great deal of workday on their feet. This is especially the case if working with hair is your main area of practice. •	Organizational skills and tidiness: Cosmetologists must always keep their work stations clean and tidy, and all of their tools organized and easy to find. •	Communication skills (especially listening): Active listening skills are absolutely essential for a successful cosmetologist. You must be able to listen to everything the client says, to ensure you know exactly what she or he wants. This is essential to being successful in this field. •	Creativity: Cosmetologists must be creative, quick thinking, and open to new ideas. •	Eagerness to learn about new ideas and techniques: Cosmetologists have to be eager lifelong learners. Prevalent hair cutting and other techniques in the field change over time, and you must be willing to stay up to date in order to maintain a high level of success. It is generally recommended that cosmetologists engage in continuing education in their field on a regular basis, in order to keep up to date. This is especially crucial, as certain beauty techniques and practices can become dated and unfashionable rather quickly. How Can I Become a Cosmetologist in the state of Louisiana? In order to work as a cosmetologist in Louisiana, you will need to be licensed. 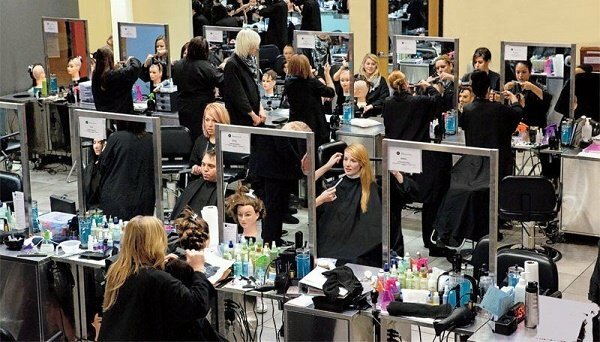 In order to obtain a license to work as a cosmetologist, you will need to have completed at least grade 10 in high school (although it is much better to have your full high school education), be at least 16 years old, have completed 1500 hours in a cosmetologist education and training program at an approved institution, pass the State Board examinations required, and pay the required fees. Once you have satisfied all these requirements, you must apply to the Louisiana Board of Cosmetology for a license to practice as a cosmetologist. It is possible to study to become a cosmetologist (thus completing your required 1500 hours of cosmetologist education) on either a full-time or part-time basis. If you study on a full-time basis, there are many programs that will allow you to graduate within two years. You will learn about many different things in your cosmetology program. You will study hair and hair styling, nail care, skin care, and makeup. You will become closely acquainted with all the techniques and skills you will need to be successful in the field. Your cosmetology program will provide you with a mixture of theory (classroom instruction) and practice. In your cosmetology program, you will receive in-depth instruction on hair, nails, and skin anatomy and physiology, as well as the chemistry of beauty products, treatments, and hair color. You will spend a lot of time learning about the chemistry of hair color. This is extremely important, as in many salons you will have to mix your own color for clients. You will practice mixing hair color, carrying out special hair treatments, doing hair highlights, and using hair relaxers. Additionally, you will also learn everything you need to know about sterilization, sanitation, and safety. You will learn the proper procedures for cleaning all tools, including combs, scissors, brushes, irons, and hair rollers. You will be trained in how to identify scalp illnesses. Instruction in how to protect clients from other clients’ lice or dandruff problems will also be provided. Your cosmetology program will also give you the business skills you will need to be successful. Relevant business skills should include shop management, salesmanship, client relations, and ethics. This will involve information on marketing and sales, client relations, building a loyal client base, general professionalism and communication skills, critical thinking, and ethics. Examples of specific courses you might be required to take during your cosmetology program in Louisiana include: Louisiana Cosmetology Act and Rules Regulations; scientific concepts of infection control; hair shaping; OSHA Requirements; hair designing; human physiology; chemical services, chemical principles; manicuring; shampooing; rinsing and conditioning; makeup application; draping; and facials. In order to get your license as a cosmetologist in Louisiana, you will be required to pass both the national NIC (National Instate Council) written and practical exams, as well as a Louisiana state exam. You can take the written NIC exam once you have done 1,000 hours of your cosmetology education, but you must wait until you finish your education before you can take the practical NIC exam. You will quality for your Louisiana cosmetology license only if you achieve a minimum of 75% on the NIC exam. The NIC exam is administered by DL Roope Administrations, Inc. The written NIC exam is 90 minutes in duration, while the practical exam is three hours in length. In the NIC practical exam, your skills will be evaluated in several areas, including: set up and protection of the client; haircutting; thermal curling; relaxer retouch; virgin relaxer application; chemical waving; hair color retouch; and virgin hair lightening. The exam also involves a candidate summary and final cleanup. The Louisiana state exam primarily tests your knowledge of Louisiana Cosmetology laws and regulations. Once you have successfully completed all three exams (the NIC written exam, the NIC practical exam, and the Louisiana state exam), you will be qualified to obtain your license. If you have in mind perhaps one day becoming a salon manager or cosmology instructor, it is recommended that you get at least five years of experience working in the field before attempting to gain such a position. You will generally need that much experience before employers will consider you for such positions. Five years of experience is also considered the minimum you should really have before beginning to think about starting your own business (opening your own salon). Once you have your Louisiana cosmetology license, you will have to renew it once a year. This must be done on your birthday, and the process costs $25. You might decide to take one or more advanced beauty courses after you are finished your education or after you are licensed. Advanced beauty courses generally allow you to become more specialized in one or more particular areas, with in-depth exploration and learning of theory and techniques. If you have already decided that you will want to specialize in a specific area eventually, try to find a school that provides advanced beauty classes in that area of specialty. A typical day can vary greatly from one cosmetologist to another, depending on their employer and their work situation, and whether or not they have an area or areas of specialty. Here we will discuss some of the most common duties involved in the typical day of a cosmetologist who is mainly focussed on hair. How Much Money Do Cosmetologists Make? According to data at Payscale.com, cosmetologists in the United States have an hourly wage range of between $7.55 and $16.36 per hour. Tips often pay a significant role in how much a cosmetologist makes, and the hourly range for tips is between $0.62 and $6.38 per hour. According to the Work.chron.com site, cosmetologists have an average hourly wage of $12.72, and an average annual salary of $26,460 in the United States. As in many other professions, in cosmetology you are likely to earn progressively more than you do at the beginning, with experience. In Baton Rouge, Louisiana, cosmetologists have an average starting yearly pay of $29,942, with an average yearly salary for all in the field of $36,359. In Shreveport, Louisiana, cosmetologists have an average starting pay of $26,338 per year, while the average yearly salary for all in the field is $31,892. Cosmetology is growing at a rate faster than the average of all other occupations. This means that high numbers of new jobs and opportunities are expected to be available in the coming years. As mentioned earlier, you should make sure that you have at least five years of experience in the field before thinking about opening your own salon. This is important, to ensure that your skills as a cosmetologist are so strong that the distraction of having to deal with a great many business concerns will not cause you to be swamped and overwhelmed. It is also important as it will help ensure that you already have a loyal client base that will follow you to your new establishment. If you want to open a salon one day, you are probably thinking of a salon that you will start from scratch and name yourself. This is generally a wonderful option (as long as you are fully informed and prepared regarding the costs and risks involved), but you should be aware that there are two other options. One of those is to purchase and take over an already established salon, and the other is to purchase and open a franchise hair salon. Buying an already established salon is useful in that it will come with a roster of a certain number of clients who are attached to the specific location. If the previous owner is retiring and his or her services will no longer be available, that will probably increase the number of clients who will stay loyal to the salon itself.